We all knew that kid in high school that loved one band and one band only. They would only wear t-shirts that had their favorite band’s logo emblazoned on the front and back. Every time they talked about the band it was sycophantic and tried to evangelize you into buying the latest album (or whichever one they were listening to that week). Doug really liked Queensrÿche and he wasn’t shy about it. If I had to choose one genre of music to describe my high school, I couldn’t. You had the jocks who would blast the loudest heavy metal in the weight room. The theatre and choir kids would sing their favorite showtunes in the halls. Pop describe most of the lunch room with the token 2 or 3 tables of Hip Hop stuck in the corner farthest from the door. Doug had a cleft palate and high school kids being high school kids, he tried to fit in and be friends with anyone, but wouldn’t be given the chance. Even our small group of misfits from Table 9 in the lunchroom didn’t like hanging out with Doug…and not out of choice, we didn’t hang out with anyone other than our small circle. If Doug came up to our group in the hall, we would try and avoid him as much as possible. If a conversation started, we would look for ways to end it and move on without him. Come to think of it, we were real dicks to Doug and he didn’t deserve it. Right about the time I was in high school, Queensrÿche’s “Silent Lucidity” was huge. It was huger than huge. You could not escape from it, playing constantly on MTV and the local Top 40 radio station. As if that wasn’t enough, I went out and bought the cassette single and just happened to mention it to Doug in passing. You would think the kid’s head was about to explode with glee as he launched into the entire storyline of Operation: Mindcrime. Saved by the bell about 15 minutes later, Doug still hadn’t gotten to the halfway point in his spoiler-filled story. Each time we were together he asked, “You listen to Operation: Mindcrime yet?” I kept saying “no” in hopes that it would eventually wear him down and he would stop asking me. And then one day it happened. I don’t know when, nor did I mark it with a special occasion. Doug stopped talking to me about Operation: Mindcrime or Queensrÿche. This could have been about the time that we were all applying to colleges and studying for entrance exams. 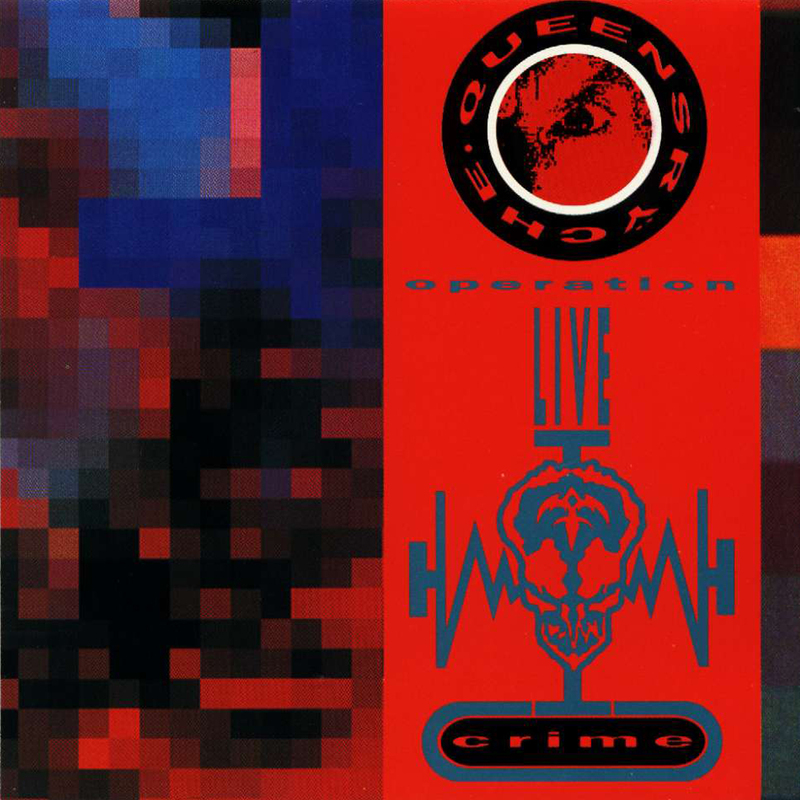 I still hadn’t listened to Operation: Mindcrime when Operation: Livecrime was released. I don’t know why I bought it. I had no other albums by Queensrÿche but there was something about seeing the long box and the bonus VHS tape of the show. Or it could have been the fact that I was rolling in cash from all the lawns that I was mowing. Disposable income has a very different meaning when you are a teen. I remember now…it was a day that I was home alone. Parents were at work, sister was doing something somewhere with someone. I popped in the VHS tape and started to watch it. I didn’t get it at first but I continued to watch it. Not sure what I was expecting but something caught me off guard. At the time, I was a sucker for the long songs. Songs that go beyond the standard 3 minute mark for Top 40 radio and seeing how “Suite Sister Mary” came in at over 11 minutes I was ecstatic to hear and see it. That was the turning point in my feelings on Queensrÿche. The song was pure theatre both on the screen and coming out of the speakers. Geoff Tate’s voice (and ponytail) turned me into a fan of the album and the band. To this day, I can’t start the album without listening to the whole thing from start to finish. There’s a buildup knowing that “Suite Sister Mary” will be heard at some point and then the rest of the album is enjoying the downward crescendo until the album ends. Knowing how much I like the music of Queensrÿche, I don’t know if it would be the same if Doug hadn’t talked so much about them. I never got the chance to talk about the band with him and how much I enjoy listening to their music. Looking back, I see this as a missed opportunity and wonder how life would have been different if I had related with Doug a little differently.